But now back to the flip – it’s been FOREVER since I’ve told you what’s going on over there! Big things, my friends, big things. I’m telling you right now – this is a photo-heavy post so if you have an aversion to pics of construction goodness then I suggest you look away now. You’ve been warned. 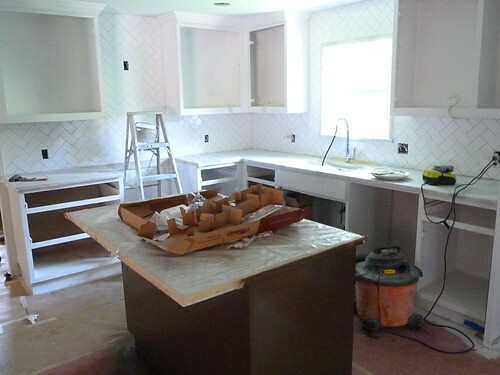 First of all, the kitchen actually looks like a kitchen – who knew that day would ever come! The cabinets were delivered . . .
. . . and installed . . .
. . . and the backsplash went in, subway tile with gray grout . . .
. . . and the cabinets are being painted! The bathrooms are also really coming along. I’m in LOVE with the master bathroom! And the jack ‘n jill bathroom is looking good, too. The original beams and built-ins in the den and dining room are getting a coat of rich brown paint, along with the kitchen island. I’m excited about how it’s looking so far! 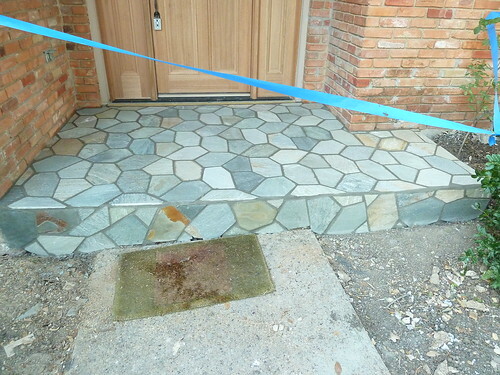 And last but not least, the front porch got snazzed up with some slate tile. You’re not going to believe me when I tell you this, but the flip will be ready to go on the market in less than 2 weeks (in reality, our contractor says it will be ready in 1 week but I’m adding in a fudge factor). Yes!!!!! Of course there are still a zillion things that need to be completed (finish painting the interior, landscaping, painting the exterior of the house, installing lighting fixtures, sanding and staining the floors, installing hardware) but all of that stuff goes really fast. Yippee! I’ll keep you guys posted with any fun new developments! 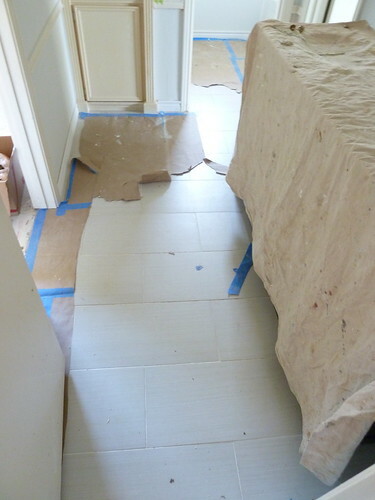 I absolutely LOVE how you chose to place the tile in the kitchen! Gorgeous! 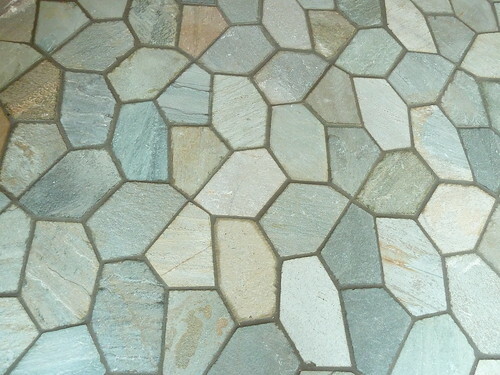 I LOVE your slate tile on the porch and the kitchen subway tile! Maybe I need some new tile in my world? Fabulous!! Everything is looking good so far! Love the master shower. 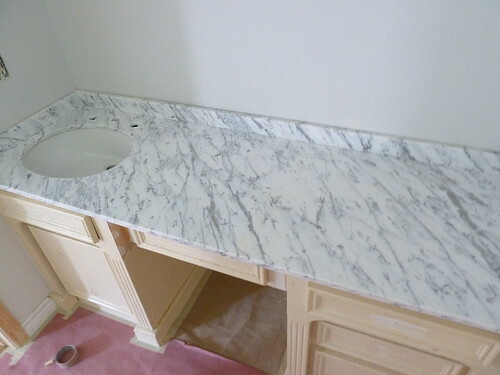 I can’t wait to see more marble on the counter tops!! And 1-2 weeks completed?! Amazing. GOOD LUCK! Wow. Just wow. I liked your choices for the last flip, but this one makes me want to sell my house, move, and buy this place! I *love* the subway tile in the kitchen. And the bathrooms are amazing!!! I hope you’ll do a source list for where you got all that tile… Drool. Yay!!! I feel a little disloyal to the other houses we’ve done but this one is shaping up to be my favorite as well. :) And I will definitely share as much info as I can! 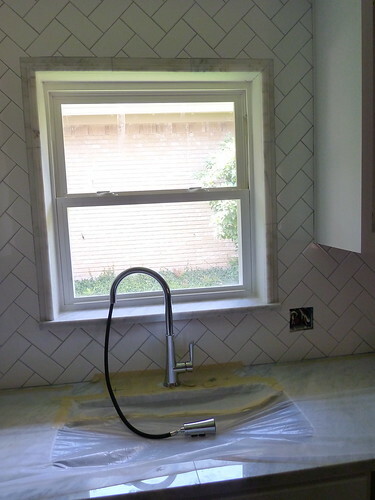 everything looks fantastic, but I am OMG in love with the herringbone backsplash. I’m sorry, but we can no longer be friends. 2 weeks? I want to cry. Okay. Maybe we can still be friends. But I’m insanely jealous. And it’s just gorgeous. Everything. You’re nuts – you guys are rocking it out, and you’re DIYing it all!! I’m amazed, my friend. OH MY GOSH! Amazing! I can’t believe how fabulous it is. 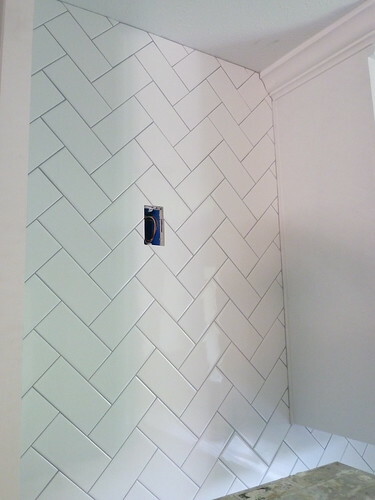 The subway tile on the zig zag is brilliant! Gorgeous! LOVE WANT NEED! And the bathrooms are fab too. Seriously, standing ovation from New Jersey!!! Are you guys the fastest flippers on the planet, or is it just me? 2 obsessions in this post: the backsplash (I thought I only loved tiny, skinny, glass tile backsplashes, but I was SO WRONG) and the floor tile in the jack n’ jill bathroom (loving the oversized-ness of them). So excited to see the final result! It’s looking fabulous. And so fast! 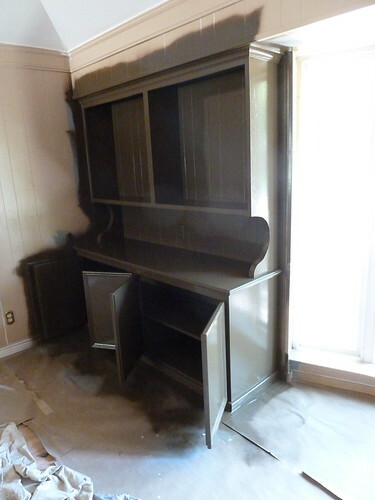 Tell be about the cabinets… do you get a good deal on them somewhere unfinished? I LOVE what you’ve done! It looks so great! I can’t believe it will be on the market in 2 weeks! Good work! Dang, I have to admit I’m super jealous of your cash flow for these wonderful flips! It looks fabulous, some buyer is going to be thrilled. Where do you buy your kitchen cabinets and how do you paint them? I really like what you did to all of the kitchens. 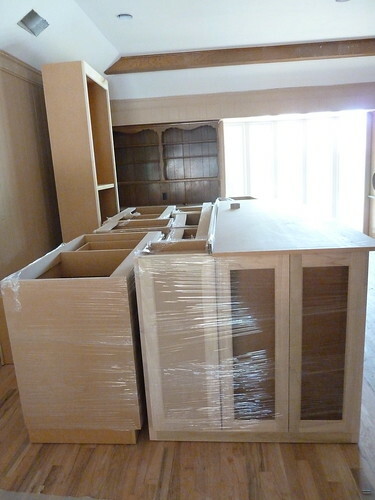 I’m ready to renovate my kitchen and finding new cabinets is not that easy and very, very expensive…. Thanks! 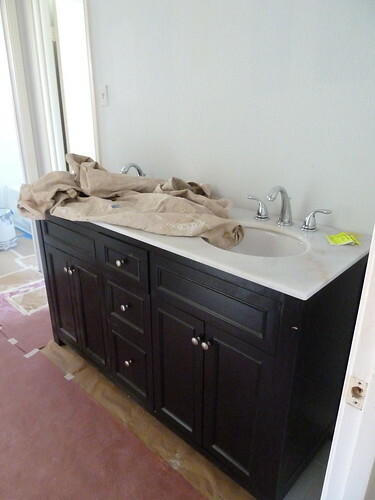 This kitchen and bathroom are going to look amazing! 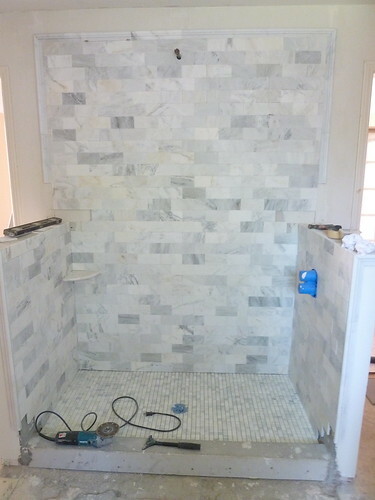 I have to admit it is refreshing to see another flipper that doesn’t think its taboo to use marble! I really like the master bathroom it is is very spacious. Does it have a bathtub to lay down and relax? I want your job as a flipper!!!! But I wouldn’t do as a good job as you did on this one. 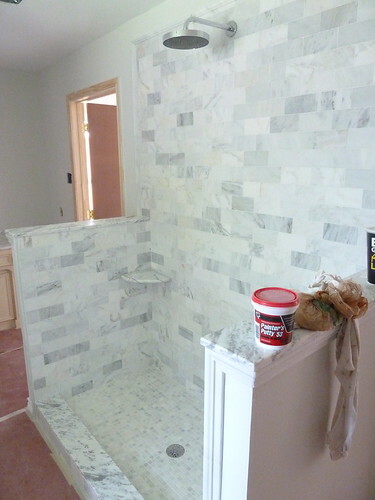 All that marble… drool. It looks so wonderful. I really admire your choice for the tile. 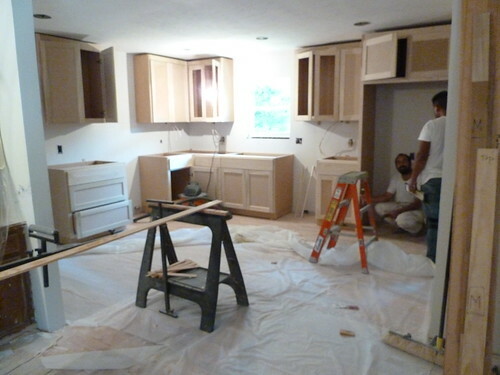 .Painting kitchen cabinets is relatively easy and can really give your entire kitchen a new and updated look. If you take your time your kitchen cabinets will look like they are brand new no matter how old they may actually be..